Them: How was your Holidays. Them: It was warm here too. Shorts and t shirt weather on Christmas day! This weather is so strange. I usually like to go to Florida to defrost but not this year, the cold weather didn’t arrive until I got back. Brrr. But not complaining it is nice to get a break. So for some updates… it has been a month since my last post. Noah Kinzer went to a great family in New York. He is loved by 2 little boys and will do great in his forever home. I have a new temporary foster. Sebastian/Jack/Buddy. The rescue calls him Sebastian. His new adoptive parents are going to call him Jack or JD for Jack Daniels because he came from Tennessee. I have given him the nick name Buddy. He is a very sweet 4 year old beagle mix. Great in the house, with my dogs, potty trained and so easy going. I will have him for a total of a week as I am meeting his new family in Delaware on Saturday. Piper completely tore her ACL. She is such a sweet old lady and a trooper. We are managing it medically with pain killers and supplements. It has been about a month and she is starting to improve, using the leg more and getting around a little better. Riley enjoyed our hike on the day we dropped off Kinzer. He is such a love. I finally got on Warlock. We took it easy, maybe too easy. He definitely was testing me. At one point he just stopped, decided he wasn’t going to move forward any more. But we worked through it and eventually he got the idea that moving as I asked him was better than not. 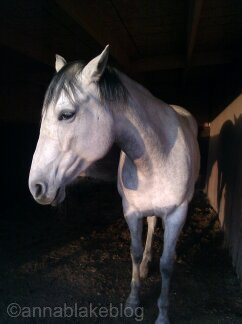 He is such a cool horse. 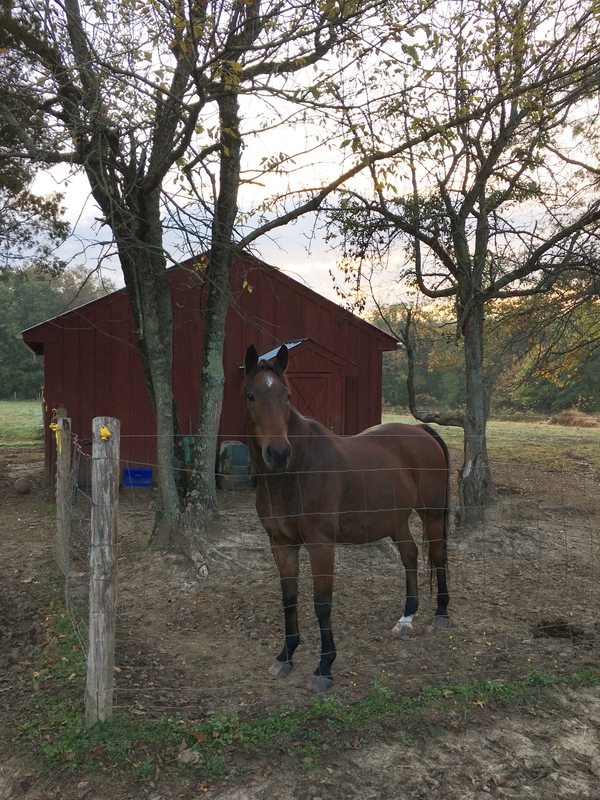 He helps me every time I do barn work. He helps me his latest trick is to pick up the wheel barrow by the handle. He has yet to dump it out on me. 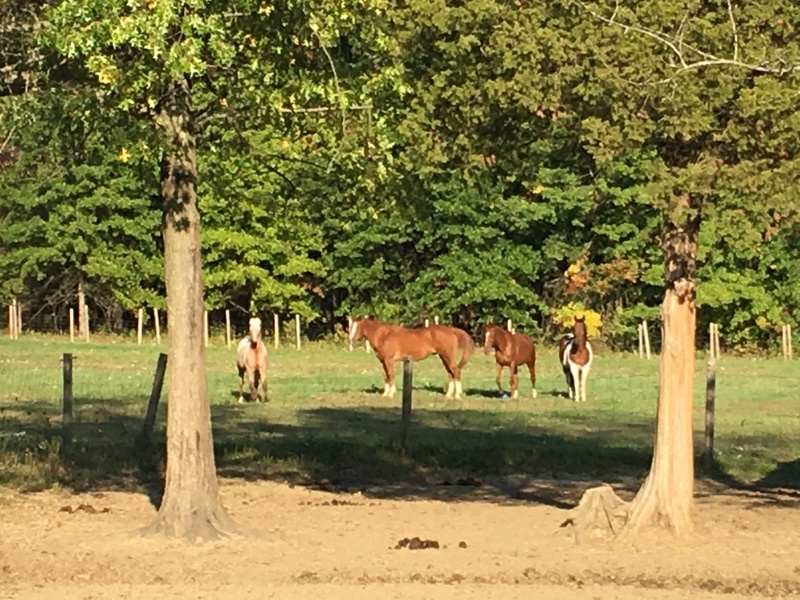 We are down to 5 horses at the farm. Izzy left while I was on vacation. It is so much easier having only 5 horses. They all have in and out access to the pastures so with 3 in the main barn the barn work goes quick. Which is great going into winter as on those cold mornings and evenings we want to minimize our time out there. Warlock the wonder horse is back! 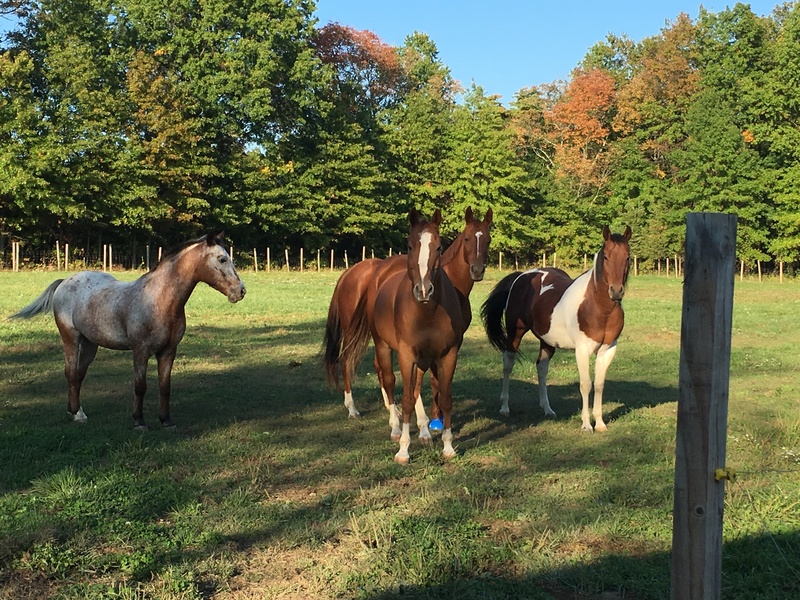 After a few month training at Rachael’s farm Warlock is back with his dad and the herd. Izzy and Chex were so glad to see him! Apple eah not so much. Later that week I captured a beautiful run around session with father and son. Over the weekend was the first time in forever my 3 kitties were together. 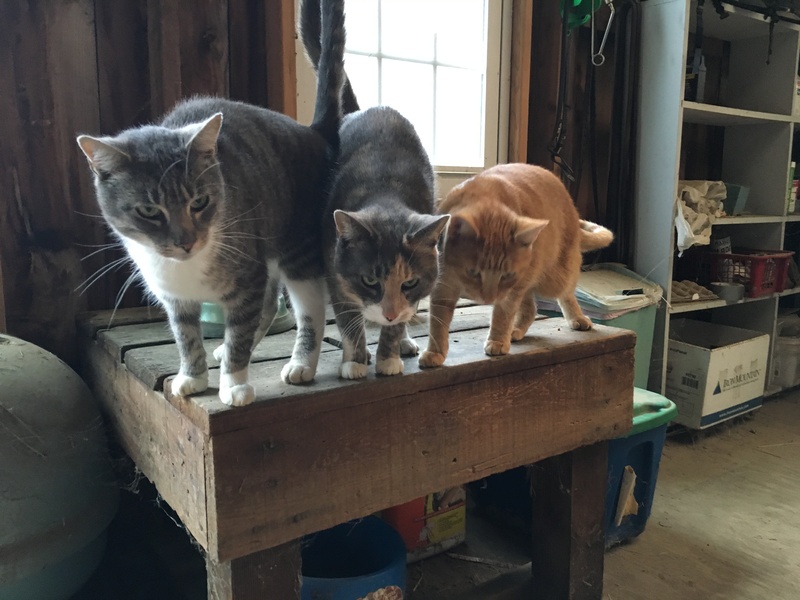 Being barn cats you wonder about their welfare when you don’t see them for a while. So I captured the moment with them. I hope the new owners are OK with them staying behind. 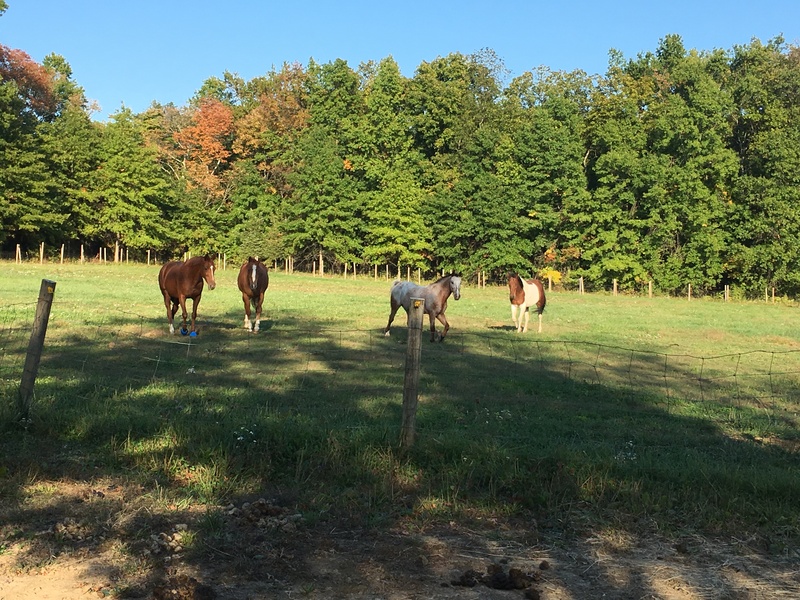 On Sunday, we took Dalton, Apples and Chex on a trail ride around Green Lane. 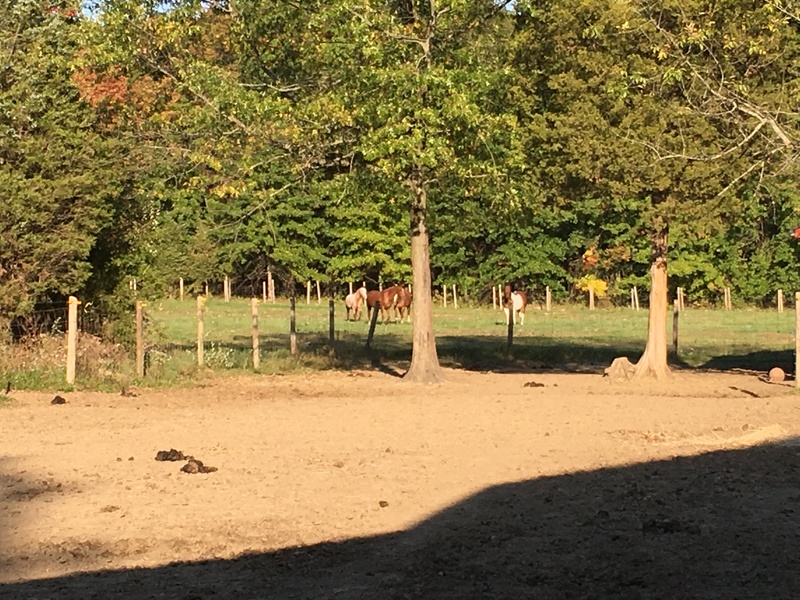 It was a perfect fall day to get the horses out. Fresh air, open spaces and trials through the woods is a great way to clear the cob webs from your head. So the other day I look out my office window (upstairs of my house) to see people walking through my woods. A showing was here at the same time so I popped my head out to find out if it was them. The individuals from the showing spoke to those walking through my property. They said a calf escaped from a neighbor’s property and was running through my farm. 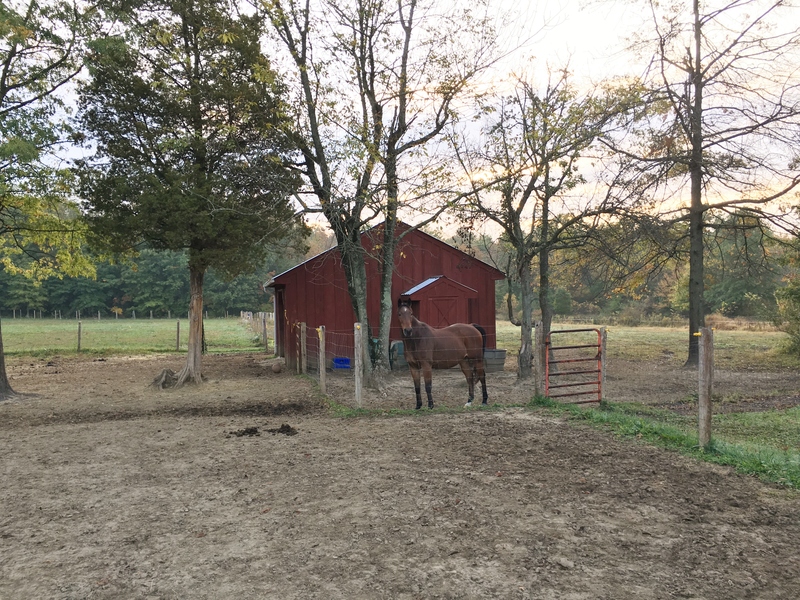 I went to feed that evening to find the horses still freaked out about the intruder. I called them for dinner and they wouldn’t come up. They were all just staring at me. I have never had them not want to come up for dinner so I walked out to them. But Chex needed a special invitation. I had to walk back to get him, he was getting upset everyone was leaving him but was still too freaked out to go with them. They all successfully came to the barn to eat dinner but it took a little while even after that to calm down. I had no idea they would be that upset by a little cow. The next morning all was well on the farm and I was feeling nostalgic for the farm and realizing the beauty of it and that I was leaving it all behind. I took these pictures of George with the morning sun coming up behind him. All of my horses are barefoot. This video is makes a compelling case for going with out shoes. It also goes with what my ferrier does. He doesn’t cut the horses frog or pare out the sole. Warning this video is graphic. It is an actual horses’ hoof cut in half, so there is some blood, tissues (lamina) and bones (coffin) involved. Great article. I really need to stop, listen and observe more. “Calming signals in horses are somewhat similar and include looking away, having lateral ears, yawning, stretching down, licking lips or eating to calm themselves. Can you recognize them? Calming cues communicate stress, and at the same time, release stress. 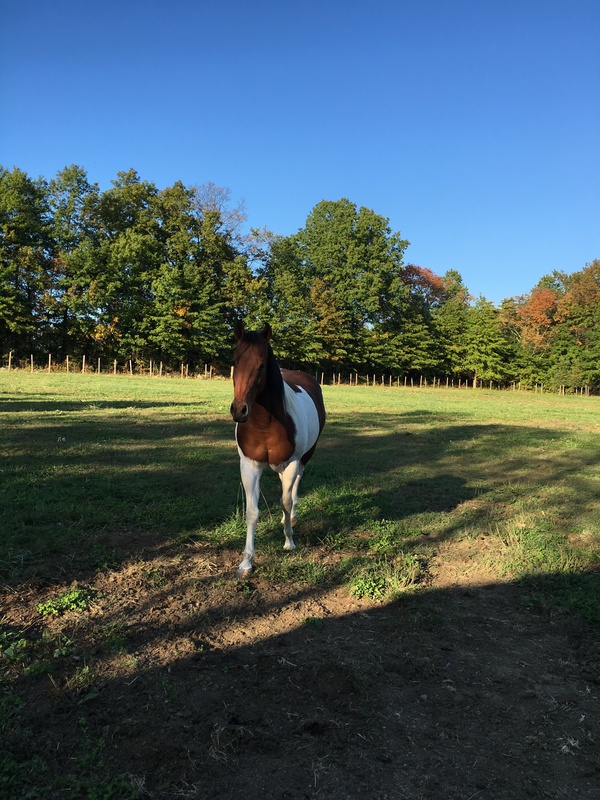 It is modeling behavior for us; they want us to drop our stress level, or aggressiveness as well.” Next time your with your horse look for these calming signals. If you are standing next to your horse and he looks away, do you think he’s distracted or even disrespectful? When your horse yawns, is he sleepy or bored? If he moves slowly, is he lazy? These are important cues from your horse, are you hearing him correctly? When it comes to communicating with horses, some humans are a bit like a self-obsessed rock star who throws a temper tantrum and trashes the room, but then assumes everyone wants his autograph. By equine standards, we ignore those around us and begin by screaming bloody-murder and escalate from there. Part of respecting a horse is remembering that their senses are much keener than ours. We can whisper. It is just like man’s vanity and impertinence to call an animal dumb because it is dumb to his dull perceptions. ~Mark Twain. A few shots of Casey and Riley kicking up their heels. They had a little run around before I went for a ride.